How cute are these?! Yesterday Jason came home from the hospital with a gift from one of the people he works with. They have been so sweet to welcome Alex with all kinds of wonderful gifts. 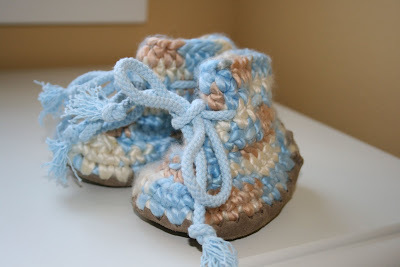 When we opened the box, I found these adorable UGG crocheted baby booties. Now I'm sort of looking forward to the Iowa winter so Alex can try these on for size...Well, okay, "looking forward to" may be an bit of an overstatement. I'm glad that when the cold weather does arrive, our son will have the cutest winter footwear around! So stinkin' cute! You just gotta love all the sweet baby stuff out there. The question is, will he actually wear them? Graham had lots of adorable little things like booties and such, but normally they either fell off or he pulled them off! But at least they're cute to look at!